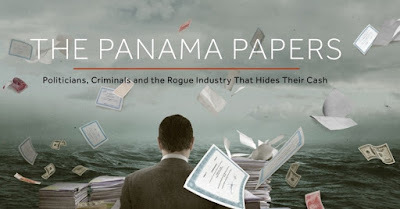 I am wondering from last three days why there is no uproar in India and many parts of the world over Panama Paper Leaks i.e the 11 million documents of Panamanian law firm Mossack Fonseca which helps its clients in setting up offshore shell companies in tax heavens like Panama and British Virginia Islands so that they can escape tax authorities of their nations. It is also astonishing that a single firm is dealing with so many high level clients who rank from State heads to sportsman to corporate houses to millionaire businessman and their relatives. Seeing lethargic attitude of media, opposition and government on The Panama Leaks I was also started detaching myself to go deep into the issue until I heard about the resignation of Iceland PM. Have we not understood the Panama Leaks properly or we are indifferent to it because it didn't involve any big politician's name? Are businessmen's who accumulating the money through illegal means hold no concern for us? Don't they harm nation's economy? Have we succumbed to our fate of a corrupt nation? Don't forget that these very business houses give donations to political parties. No political party is clean in this regard and the corporate houses or business tycoons which have so much money power over these parties are powerful enough to force politicians for amending laws and procedures. Politicians on the other hand use them for personal gain in making money and property. So if there is no political name in these leaks that don't mean our politicians are clean. Look for the proximity of these individuals with any particular political parties. Iceland people come on streets to pressurize their PM for resignation; we at least should pressurize government for time bound inquiry regarding these leaks. I am not saying that all named in these leaks have accumulated wealth by wrong means many would have done it through proper government channels. These leaks have dented images of such people and a time bound inquiry will only clear their name. Right now we have ignored Panama Papers. I am not seeing a proper debate and discussion on the topic. Except from few news reporting there is not much concrete happening on part of TV Media or digital media this is because we common citizen of this country is showing any interest in them. It is also possible that these papers have left something or not investigated someone thoroughly but these will only come in public domain after an inquiry from a government agency. All world countries are doing these but as mere formality and not as obligations which should be the need of the hour. We raise our voices to end terrorism but terrorism rises because some people are funding them through these tax heaven companies. Silence over leaks is equal to silence over death of innocent people in terror attacks. So think again and read more about Panama Leaks. Till then God Bless The World. It shall take some time to really trace the illegal transactions. May be by Sept things will be clear. Some of 500 Indians may have legit accounts. Further as usual denials of any wrong doings have started. Leaks should be taken seriously and there should be some action item on the people as well. Thanks for throwing some light on this topic, Cifar. Panama Papers are the result of changing dimensions of Investigative Journalism. This was revealed from the hard work of 370 journalists worldwide. Now we have to see whom will the government protect and whom will it punish.